My Ph.D. research is concerned with models and the act of modelling, the qualities of both object and process. In the first publication, I explained that the piece made for Testing, Testing originated from an idea to record the making of a model with a contact microphone, and a fascination with the imagery produced by Frank and Lillian Gilbreth in their time and motion study work of the early twentieth century. The Gilbreths’ produced visual models (photographic chronocyclegraphs and three dimensional wire models) to demonstrate the most efficient movement for carrying out a task. The Gilbreths’ aim was to identify a prescribed method of working to attain a predictable outcome time and again.1 Our concern was to draw out the peculiar qualities of the making process when one is uncertain of an outcome. I wanted to consider what emulation and improvisation feel like, in order to inform broader questions in my research about the nature of models and modelling. What it is to follow a template, to plan, or to resist planning one’s actions? How do we begin an action when we are unsure what is required, continue when uncertain, or conclude if we do not know what is expected? I was excited to share the Gilbreth images with my collaborator Rees Archibald. We were both somewhat seduced by the abstraction of the concrete presence of workers and their movements into glowing lines of light. 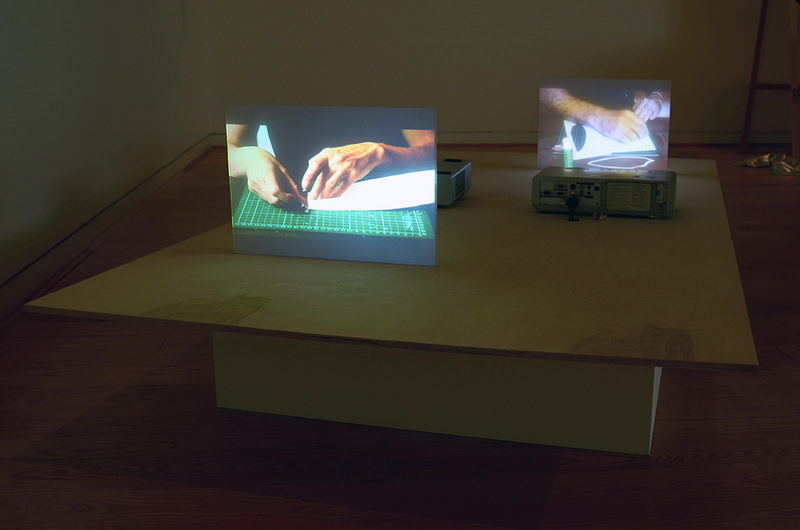 The images acted as a navigational point from which we plotted a work which would use contact microphones as the means of capture and sound as a means of transmitting the making process as a kind of pattern or score to follow. Our method would (we imagined) result in unpredictable outcomes. I had anticipated the dialogue present in this work to be a fairly straightforward comparison of the experience of making, as interpreted by one person who makes visual work and another who is more attuned to working with sound. Indeed, this has yielded some insights, but unexpected things have also been revealed, including new insights into my methodology, which will inform the next stages of my research. Each aspect of the project could be understood as a dialogue of sorts; from the process of making the recordings to installing the work; from the encounter with the work in the exhibition to the symposium, and of course the conversations between myself and Rees. Here I will attempt an account of some of the learning that has arisen through the different stages of the project. In this text, I reference some of the ideas and literature that have been companions to the work. Some of my thoughts are inconclusive, or just the start of a line of questioning, but including them acknowledges how making art work allows me a new kind of access to literature. I set up the shot and unexpectedly found myself rehearsing, making a paper model boat hull six times in total, documenting each attempt in one shot on video and audio recorder before sending the final file from Copenhagen to Vilnius. Here, without seeing what I had made, Rees listened closely and fabricated an object by improvising actions suggested by the sounds he heard. One way to think of this is as an attempt to ‘re-play’ the sounds. He recorded this process with a contact microphone.3 When we spoke via Skype a few weeks later we tried to put into words our experiences of making. The definition of rehearsal given by the Oxford dictionary is ‘To practise (a play, piece of music, or other work) for later public performance’,4 whereas practice is ‘Repeated exercise in or performance of an activity or skill so as to acquire or maintain proficiency in it.’5 So whilst rehearsal implies performing to an audience, practice focuses on the act itself, the concentration and precision arrived at through repetition. So one could rehearse a known movement with the eye of the audience in mind, but in practicing, the skills required to improvise a skilled action are most important and the act may be performed with or without an anticipated audience. My own activity in making and re-making the paper model drifted between these two states. I certainly anticipated and made decisions about the visual appearance of our work as I reviewed the footage, tweaked the lighting, adjusted the framing of the shot, or re-positioned my hands in order to allow the camera as much access as possible to the action of my fingers on the paper. But the repetition inevitably also led to a greater fluidity and confidence. Rehearsal became practice, which allowed a genuine absorption in the task. Mihaly Csikszentmihalyi describes this state as ‘flow’, and the characteristics of this state of satisfying absorption have been an important reference point in Rees’s work.6 Our conversations prior to this collaborations often engaged with this, as well as Ingold’s ideas of ‘textility’ in making.7 Through my own practice, I have some experience of such sensations in the act of making, but the source of it is not easily represented, and I am aware that I sometimes romanticise makerly practices in which the combination of the intellect and the hand is apparent. Visual cues related to work that is done for its own sake, particularly enthusiast or amateur practices, recur throughout my research. In this respect, A Fabrication continues to inform a discussion of the qualities which set such activity apart from other kinds of labour, where and how those qualities might be found and why they matter. The being ‘in the moment’ suggested by ‘flow’, the possibility of transcendence through absorption in a task called to mind Ernst Bloch’s ideas about the unrealised possibilities for the future, as well as the knowledge of the past, that exist in the moment. In making this connection, I began to understand the method used in A Fabrication as a practical means of working through Bloch’s thoughts. Levinas supports Bloch’s suggestion that Utopia can be found in diffuse actions and processes throughout human culture, that ‘Utopia does not require the imaginative construction of whole other worlds.’8 Indeed she goes on to state that ‘it is evident that contemporary culture is saturated with utopianism, even (or especially) where there is no figurative representation of an alternative world.’9 I see the action that occurs in A Fabrication as resonant with this idea. The first stage (performed by my hands) takes a pattern with a known, knowable outcome; the second action is a feat of disciplined attention, acute listening and an attempt to attain and maintain a state of ‘flow’. Although the materiality of sound was a key component in the work, in visual and tactile terms there is a dematerialisation of the act of making and its product. The temporary removal of visual information during the making process, and the restraining of the physicality of the work through the decision to install as a projection rather than to perform live, begins to suggest a deliberate fragmentation and diffusion of a narrative about making. The act of making appears in a staged setting, projected onto shot-blast acrylic, our hands glow like theatrical spectres: a representation of a certain kind of haptic experience that glows appealingly. The plywood surface suggestive of a studio workbench is a reserved but clear attempt to signal the fact that a genuine process happened here, but as with my previous work, there is a suggestion of trickery and magic in the aestheticisation of the hands on the screen. The mediation of the act perhaps even heightens the vicarious pleasure derived from watching, and it is possible that the skill suggested through dexterity and commitment of movement is much more convincing on screen. Another (albeit more hidden) element of the work that tends towards the immaterial is the conversation with another, be that a collaborator (as in this case) or an interviewee. Since the inception of my research project I have been trying to make sense of the role of the interview in my methodology. Testing, Testing has caused me to reconsider the interview as intrinsically related to the subject of the research, the act of modelling. The intimacy of a conversation with one other person sits well with my interest in scale, and the idea that through being close to another person and trying to understand their methods, I am trying to find possible templates for living to model myself upon. The actions we carried out in A Fabrication unexpectedly brought the act of transcription to the forefront. The translation from audio recording into a physical object, caused me to draw a parallel to the transcription I had made earlier in the year which revealed to me the multiple levels on which this process can operate. When I make a transcription, I am revisiting a conversation. I can recall an impression of the meeting, and of the quality of the interaction, but often will have forgotten much of the detail of actual content, or have an abbreviated set of ideas about what was said. As I listen to the recording, my expectations and my memory of the event are challenged. I hear the event not as it happened, but in fragments of between two and ten seconds, replaying full sentences, phrases or single words once (if they flow in a predictable way and my brain manages to translate what I am hearing to accurate key strokes first time) or up to six times if I misinterpret a syllable, forget a longer phrase, or mistype. I take short cuts by guessing, filling in what I imagine might come next or what I thought I heard, but always return to correct my mistakes. I am often surprised to hear a quite different conversation to the one I imagined was had. I hear my own voice, air-conducted from a recording, rather than vibrating through my bones as I usually hear it, and experience the usual discomfort that brings. I cringe at how audible my thoughts and attitudes are even if not overtly discussed. I hear my interviewee’s voice and feel excited at how much they appear to reveal. I feel affection, curiosity and frustration. Listening repeatedly feels like uncovering something that lies beneath the apparent. I sometimes use video software to listen ‘scrubbing’ back and forth through the timeline of the conversation. The incremental acute focussing of attention as I repeatedly replay, retype, annotate and re-interpret, feels like slowly cutting a groove into material with increasing pressure. Noticing thematic threads, making connections through annotation and interpretation in turn generates new understanding of the original material. That this act should have a textility of sorts, or should feel like making, surprised me.10 That I should find myself in the absorption of something like ‘flow’ when re-viewing small audio clips repeatedly, experiencing a fragmented version of an interaction that originally flowed, was an interesting revelation and will require further attention as I try to understand it as an integral part of my method. A Fabrication re-uses a template, pattern or ‘master’, and uses this as a starting point to reveal something about achieving an improvisational ‘flow’. This structure could perhaps be considered in terms of Stoner’s concepts. At the outset, there was no intention for the work to illustrate or demonstrate these ideas, but the act of making has given me new material through which I can converse with them. 1 Brian Price, Frank and Lillian Gilbreth and the manufacture and marketing of motion study, 1908-1924, (Business and economic history, 1989), <http://web.mit.edu/allanmc/www/TheGilbreths.pdf> [accessed 20 July 2016]. < https://ia802307.us.archive.org/9/items/boysbookofmodelb00yate2/boysbookofmodelb00yate2.pdf> [accessed 20 July 2016]. This choice of source material aligns with that used in past works. I often select material originating in the early twentieth century. Although not key to the function of the processes in this work, the material nevertheless has significance in the broader project. Nostalgia is important in my line of enquiry, and the social and political connotations of these source materials are a means to begin questioning what different languages of model-use imply, and what their status might be. 3 As the name suggests, this picks up vibrations through contact with objects and surfaces rather than sounds transmitted through the air. My contact microphone was damaged in transit (I was in Copenhagen at the time, Rees lives in Vilnius), so for my part of the work, a standard microphone was used. Ultimately the use of two different recording methods seemed to suit the structure of the piece. 4 Oxford Dictionaries online < https://en.oxforddictionaries.com/definition/rehearsal <> [accessed 17th September 2016]. 5 Oxford Dictionaries online < https://en.oxforddictionaries.com/definition/practise> [accessed 17th September 2016]. 6Mihaly Csikszentmihalyi, Finding flow: The psychology of engagement with everyday life (New York: Basic Books, 1997). 8 Ruth Levitas, Utopia as Method: The Imaginary Reconstitution of Society. (London: Palgrave Macmillan, 2013), p. 5. 9 Levitas (2013), p. 5. 11 Jill Stoner, Toward a Minor Architecture (Cambridge, MA: MIT Press, 2012), p. 2. Jo Ray is an artist and researcher based in Sheffield. Her practice-led Ph.D. speculates upon the nature of the model, and the use of models in self- organised practices. Scale play and flawed illusions recur in her work, which uses a range of strategies to respond intuitively to appropriated material, and to physical and social situations. Jo completed her Masters degree at the Slade School of Fine Art in 2002, and has since exhibited nationally in both gallery and public sites, undertaking numerous public commissions and residencies including Broken Watch (2007) for Northcabin Bristol, A Common Treasury (2013) for Grit an Pearl in South Shields, Stand By (2007) for Red Nile, Gateshead and Spoken For (2013) as part of the curatorial project Magnificent Distance, part of the 5 ×5 art festival in Washington DC. Jo has also worked collaboratively with Art Gene (UK) on projects including Seldom Seen (2013) a cabinet of curiosities for Piel Island.